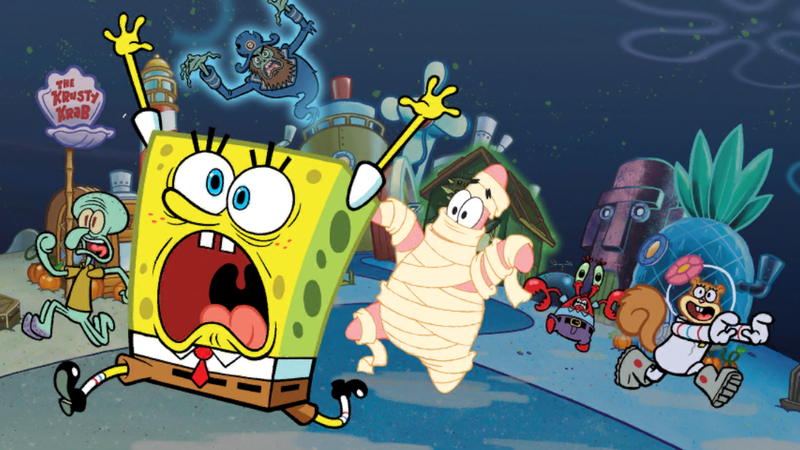 Halloween 2015 - The SpongeBob Moves In Guide Site! Q: What's new in version 4.33? A: It’s Halloween in Bikini Bottom, but SpongeBob and Patrick have discovered a plot by Martians to take over Bikini Bottom! Can the boys stop the invasion or will the Martians take over? Keep checking your Bikini Bottom for special costumes, characters and decorations available only in the month of October! New Halloween Costumes and tasks! Move in Lord Poltergeist! What does he like to do and eat? Re-released Halloween characters and decorations! Q: I can't find the task to make SpongeBob and Patrick "Go into Sandy's Rocket". What do I do? A: You should have Sandy's Rocket in the Suitcase; place it on the Map. Once you have the item available, the tasks will appear on SpongeBob and Patrick's character menus.